“I am delighted that we awarded a Blue Plaque to George Edward Hunt, a leading Arts and Crafts jewellery designer and maker. George Hunt lived and worked in Birmingham for the whole of his professional career and from the late 192Os until his death in 1960, his home was in Bull Street, Harborne, where he also produced his jewellery in a studio at the bottom of his garden. To give some insights into his life and work – George Hunt was born in Dudley in 1892 and by the age of 16 his artistic talent must have become evident, for he was awarded free places at the Birmingham School of Art and the Vittoria Street School of Jewellery and Silversmithing. He was taught by eminent tutors and undoubtedly influenced by the work of Arthur Gaskin the headmaster of the School of Jewellery and his wife Georgie Gaskin, themselves, notable jewellery makers. George Hunt went on to become a prolific as well as notable jewellery maker himself. By the 1920s he was a member of the Arts and Crafts Exhibition Society, which had been set up during the 1880s to promote decorative arts; and so in this arena, he was exhibiting alongside eminent jewellery makers and silversmiths such as the Gaskins, John Paul Cooper and Omar Ramsden. The Arts and Crafts Society exhibition catalogue of 1926 records that he showed 5 varied pieces in that show – which took place at the Royal Academy in London – including a silver and gilt enamelled vinaigrette, set with rock crystal and opals; a silver scent bottle; and presumably his star piece – a silver and gold bracelet set with diamonds, with a price tag of £25.00 – one of the more expensive items in the exhibition (probably around £1400 at today’s prices). It has also been recorded that George Hunt exhibited in Paris and throughout the UK; and that by the 1920s his clientele included members of the aristocracy. The late Queen Mother is also reputed to have been one of his clients. George Hunt is particularly noted for his Arts and Crafts-style jewellery and other decorative pieces, but he also produced work in a variety of other styles. Examples of his work figure in important public museum collections including Birmingham Museum and Art Gallery and the Victoria and Albert Museum. Somewhat further afield – there is also a brooch made by George Hunt in 1922 in the Powerhouse Museum in Sydney, Australia. In 2006, Bonhams, the auctioneers staged an exhibition of his work entitled The Silent World of an Arts and Crafts Jeweller in London, Bath and nearby Knowle. The ‘silent world’ being a reference to the fact that he became deaf at the age of five after contracting diphtheria. By all accounts George Hunt was a colourful character. Recalled as a tall, bespectacled man who spoke loudly and quickly, an outgoing and rather bohemian figure who reportedly wore a black cape and hat while out and about. George Hunt is certainly deserving of more recognition than perhaps he has been afforded to date. Birmingham Civic Society awards Blue Plaques to individuals who achieved distinction through making a significant contribution to the city. Or, through excelling in their career – undoubtedly George Hunt meets this criterion. 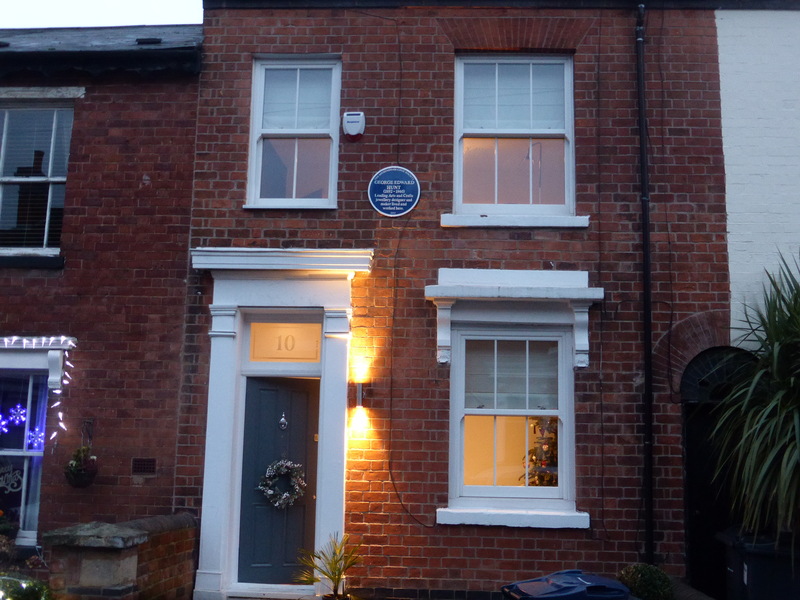 We were particularly grateful to Philippa Russell, a Harborne resident who nominated George Hunt for a Blue Plaque and who shared her research and writing about him. 2017 marked 125 years since his birth. It was also very fitting to unveil the plaque at St Peter’s Church. When George Hunt died in 1960, he was buried alongside his parents in the churchyard, in the grave he’d designed for his mother. The headstone is reminiscent of Tutankhamun’s tomb (he knew its discoverer) and bears a bronze panel designed in remembrance of his mother. George’s name figures on the kerbstone of the grave.